Each wand is hand crafted from real wood. The process of making the wands takes 11 months from start to finish. 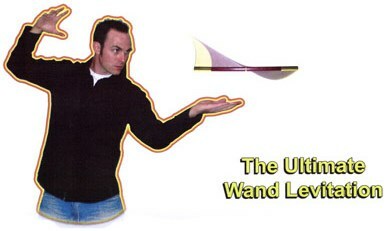 Each wand has been created using several trade secret processes to make them perfect for professional levitations. Made from real wood, hand sanded, stained, and poly coated 3 times, hand sanding between each coat. In the end creating an ultra light, heavy looking, red mahogony, and brass tipped proffesional wand. Each wand is digitally weighed before, during and after the process to ensure a superior ultra light finished product, weighing on average only 5 grams. That's less than an american quarter ($0.25 cent piece weighs 5.6 grams). This is a collectors item that will treasured for years to come. Many magicians from around the world bought 2. One for performance and one to keep as a beautiful collectors piece.